As an heraldic artist I value and enjoy the opportunity to offer the client a truly bespoke and personalized piece of artwork. A coat of arms created for an individual is designed to carry elements, symbols and historical references unique to them and their family, making the design truly personal. When commissioning a Family Tree, I might sometimes include vignettes that reflect the lives and loves of the family, from portraits or properties, old style maps of the area of the family’s origins, or favourite flowers and animals, within the text or an illuminated border. I like to continue this tradition in every piece of bespoke artwork, working together and guiding the client so we can achieve a unique and personal depiction for them or their loved ones. Personal coats of arms and Heraldry associated with the surname, can be depicted in various sizes using the finest materials including handmade paper, calfskin vellum and 24ct gold then framed to your taste to make an elegant gift. Family Trees can be drawn-up and scrivened in the finest calligraphy on handmade paper using Chinese stick inks, watercolour and 24ct gold, incorporating personal heraldry and illuminated with decorative borders or watercolour vignettes. If required, research into your family history can be done by some of the world’s leading genealogists. These make a wonderful gift for celebrations of weddings and anniversaries. Hand written with gold or platinum leaf with watercolour vignettes on vellum or handmade paper. Favourite poems can be beautifully written in Calligraphic script and illuminated with a decorative border in raised burnished gold leaf and watercolour on handmade paper or calfskin vellum. These make a special and personal gift to a loved one or perhaps as a unique wedding gift. An Illuminated Address to a retiring colleague can offer a welcome alternative to the usual carriage clock. It is a personal way to convey real appreciation and respect. 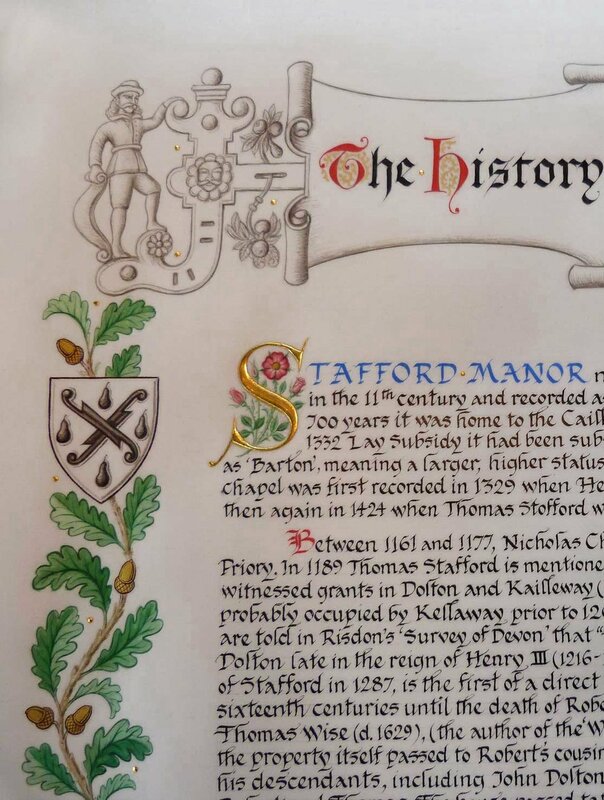 Can be presented as a beautiful document on handmade paper or vellum with a watercolour illustration of the property and illuminated with locative or historical themes. Research can also be provided.